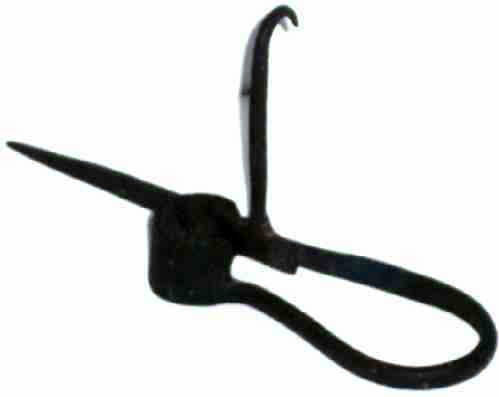 Presented here, an early Lighting Device called a "Sticking Tommy" as the spike could be driven into a post or wall and thus provide light where needed. Miners used these lamps down in the mines as they could be moved from place to place as they moved. These could also be used in the home environment by driving the spike into a chink in the wall or alternately hung over the back of a chair by the hook. Made of hand wrought iron, it is 7-1/4" long and 3-1/4" high. The condition is very fine with only minor surface rust. There appears to be an illegible mark on the spike.